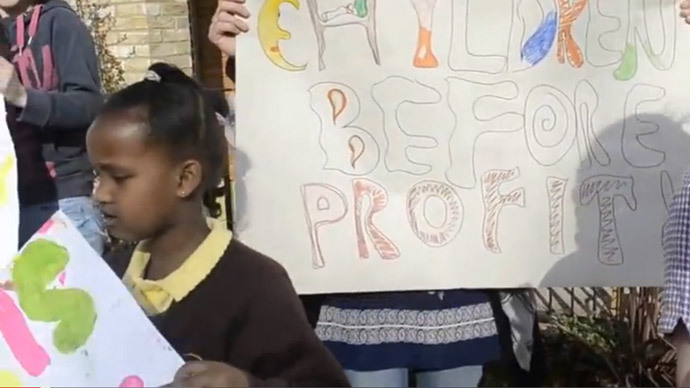 A group of ‘disappointed’ parents and their toddlers occupied a London nursery which was forced to close down ahead of redevelopment plans in the area to build a new luxury estate. Valley pre-school in Barnet, North London, closed down at the end of March. The closure sparked protests in the area, as it left 15 children with nowhere to go. Residents in the area have condemned Barnet Council’s plans to demolish 400 homes on the Dollis Valley estate in order to sell the land for £11 million to build a mixture of private and social housing. The majority of the homes in the estate will be converted into luxury apartments for private sale. The prices will range from £300,000 to £900,000. Despite Barnet Council’s original plan for the nursery to remain open until the end of summer, it was closed four months earlier to make way for construction work. A new private nursery will be opened, but not until September. There are 162 families on the estate who have secure council tenancies. The council has promised these residents new homes in the area, but they will have to pay more rent. The 181 families with non-secure agreements will be rehoused elsewhere. Christine, a secure tenant who is guaranteed a new home on the estate, told the Guardian she is “pleased to be getting a new home” but is aware it will be much smaller than her current address. “I don’t know what kind of tenancy I will have with the housing association or how secure it will be,” she told the paper. However, Mina, who is an insecure tenant, told the Guardian she is still unaware of “when the council will be moving me or where to. “I have two part-time jobs locally and my younger son will be doing his GCSEs [final school exams] soon,” she said. Mina “doesn’t want to leave” the estate, as it is where her community is. A Barnet council spokeswoman condemned the protests, and claimed legal action would be taken against organizers. Now at Dollis Valley Nursery community meeting. Another estate being socially cleansed in Barnet. LONDON IS NOT A PLAYGROUND FOR THE RICH! Homelessness in London has increased by 79 percent since 2010 when the Conservative-Liberal Democrat coalition came to power. Nearly 750 people are estimated to be sleeping rough in the capital. Earlier this month, it emerged that a Tory minister was well aware of the risks of the extending the ‘right-to-buy’ scheme. In a leaked letter, former Housing Minister Kris Hopkins said the idea of making housing associations sell off housing was “fraught with risk.” The letter shows ministers know the policy could reduce the number of affordable homes. “It beggars belief that the Conservatives have made these plans the centerpiece of their manifesto despite knowing the damage they would have on communities,” Liberal Democrat housing spokesman Stephen Williams said.